First-half goals from Marc Richards and John-Joe O'Toole secured a first win in seven games for League Two strugglers Northampton at Exeter's expense. City had early chances through Tom Nichols and Aaron Davies before Richards bundled in Brendan Moloney's cross for the opener. Richards should have added a second when he fired wide, but O'Toole charged through and scored shortly after. Alex Nicholls missed a late chance for Exeter, who have lost three in a row. 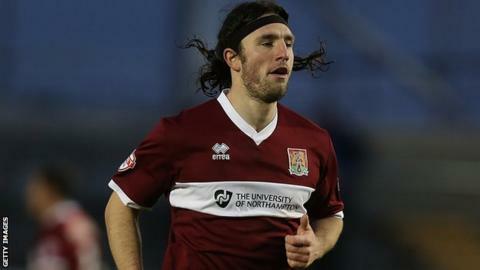 Northampton's win saw them move five points clear of the bottom two, while the Grecians are two points adrift of the play-offs. "I'm delighted that we got a clean sheet. I thought we had man-of-the-match performances all over the pitch. "I still think there is more to come from John-Joe O'Toole. He links the play up, but he knows he has to work hard. "I look at the league table every half an hour - and maybe I shouldn't because it does my nut in. But we've now got a committed group of players who want to do well for the football club." Match ends, Exeter City 0, Northampton Town 2. Second Half ends, Exeter City 0, Northampton Town 2. Ryan Cresswell (Northampton Town) wins a free kick in the attacking half. Substitution, Northampton Town. Chris Hackett replaces Marc Richards. Attempt missed. Ricky Holmes (Northampton Town) right footed shot from a difficult angle on the left is too high. Liam Sercombe (Exeter City) is shown the yellow card. Substitution, Northampton Town. Emile Sinclair replaces John-Joe O'Toole. Corner, Northampton Town. Conceded by Christian Ribeiro. Substitution, Exeter City. Graham Cummins replaces Clinton Morrison. Lee Collins (Northampton Town) wins a free kick in the defensive half. Attempt saved. Alex Nicholls (Exeter City) header from the left side of the six yard box is saved in the bottom left corner. Substitution, Exeter City. Alex Nicholls replaces Danny Butterfield. Attempt missed. John-Joe O'Toole (Northampton Town) header from the centre of the box is close, but misses to the right. Corner, Exeter City. Conceded by Brendon Moloney. Second Half begins Exeter City 0, Northampton Town 2. First Half ends, Exeter City 0, Northampton Town 2. Ryan Cresswell (Northampton Town) is shown the yellow card. Corner, Northampton Town. Conceded by Craig Woodman.